Samples of N. peronii collected at depths of less than about 100 m showed a slight positive correlation between fish size and depth, but no correlation between abundance and depth and no die1 change in catch rate. Feeding occurred during the day, with crustaceans (Brachyura, Natantia, Mysidacea and Stomatopoda in particular) occurring in 70% of feeding individuals and fish occurring in 17%. Individuals containing ripe eggs were found throughout the year, although the proportion of ripe fish was highest in November and December. Sexual maturity in 50% of females was attained at a fork length of about 15 cm and at an age of 1 year. 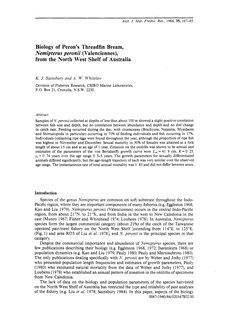 Zonation on the otoliths was shown to be annual and estimates of the parameters of the von Bertalanfy growth curve were L�∞ = 41.9 cm, K = 0.25, t0 = 0.74 years over the age range 0.5-5 years. The growth parameters for sexually differentiated animals differed significantly, but the age-length trajectory of each was very similar over the observed age range. The instantaneous rate of total annual mortality was 1.85 and did not differ between sexes.